One hundred years later, I curated a special exhibit that showcases Quentin, this young man who went to France at the age of 19 to join the massive American effort in the First World War. Titled “Quentin Roosevelt and the Great War: A President’s Son in Life and Death,” the exhibit will be on display in the Roosevelt Gallery in Lamont Library from November 2018 through October 2019. I started my historical research on Quentin Roosevelt in 2016 as a graduate student at the Sorbonne University. The core of my thesis was to understand, through Quentin’s life, the Roosevelt family’s bonds with France and the social background that triggered their daughter, Ethel, and their four sons to go to France during the war. Ethel went to France as early as September 1914 to help her husband as a medical volunteer in the American Ambulance field service. When the United States entered the war in April 1917, all four Roosevelt sons joined the American military. While they were fighting with the 1st American Infantry Division, both Teddy and Archie Roosevelt were injured several times by shrapnel, gas, and bullets. Quentin, on the other hand, decided to join the Air Service as a pilot, a most dangerous post to hold in World War One. He died on July 14, 1918 when he was shot down by a German plane during his second mission on the front. Invited by Houghton Library to work with the Theodore Roosevelt Collection, I found some of the most interesting and complete documents on Quentin Roosevelt. Materials in Houghton Library offer a new perspective on his inclination for the air. For example, a primary school redaction found years later by his old teacher, relays his desire for the air when he was 10 years old. 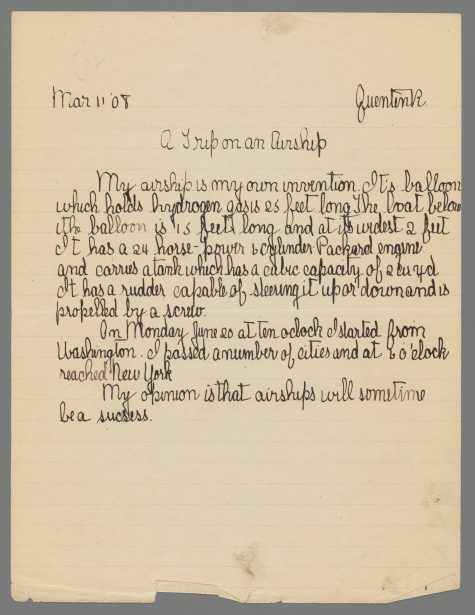 “A Trip on an Airship”, school paper written by Quentin Roosevelt in sixth grade, 1908. [95M-29, box 1, folder 42] Houghton Library, Harvard University. It seems that rather than being influenced by one particular event, Quentin was drawn to aviation through the general atmosphere of the beginning of the century, when new technologies and high-speed machines were cherished because they were full of fascinating possibilities—possibilities that he dreamt of as a child, and that he kept when he entered Harvard University. While the presidential papers focus on the public and political evolution of the father, materials in the Roosevelt Collection show the intermingling of politics and privacy within the family. As the children lived in the White House when their father was president, it seems reasonable that they were steadily influenced by his political work and ideas. But political culture was not the only way that the family engaged with politics. Some of the children, as in the case of Quentin, were used in international politics as a means to reinforce personal friendships between Theodore Roosevelt and the French, or Japanese ambassadors. Houghton materials have revealed information on what has become my main research topic: the intimate bonds between the Roosevelt family and France. This was the most enjoyable surprise for me here. 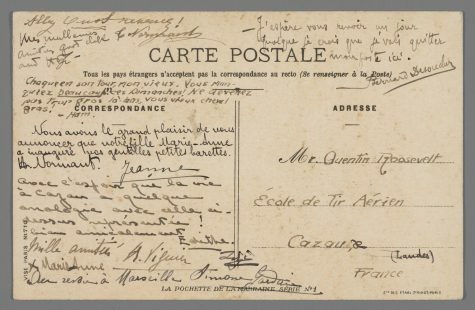 I had already found most of the public and official links between the Roosevelts and France, but at Harvard I had the pleasure to read French personal letters sent to Quentin and other members of the family. Among the valuable resources I found in Houghton archives were postcards, photos, and a very precious photo album recording all the social activities Quentin had with a French family, the Normants. Postcard to Quentin Roosevelt from the Normant family, ca. 1918. [MS Am 2835, box 18, folder 393] Houghton Library, Harvard University. Quentin met the Normant family on the side of a country road, where their car had broken down. He helped to fix the car, beginning a powerful relationship that led to the events in the photo album. 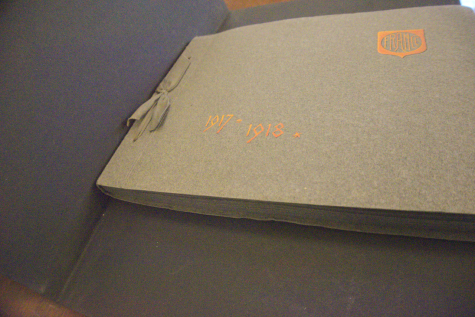 Photo album from the Normants, 1917-1918. [MS Am 2925, box 5, folder 99] Houghton Library, Harvard University. What makes this relationship so significant for the historian is that it offers an alternative perspective on the field of international relationships. Beside the state or non-governmental organization levels, relationships can also be looked from a network perspective. Through the eyes of a single individual, one can analyze how international relationships are also a matter of social connections, of class, and of individual wealth. The main influence of this one officer in a massive war was cultural. 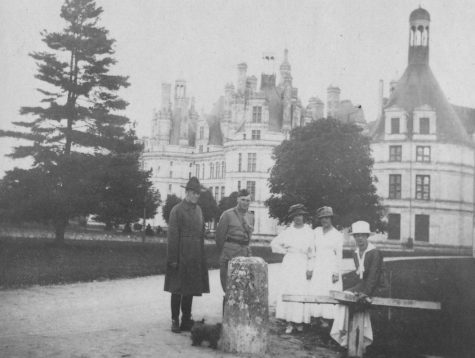 When Quentin Roosevelt took a tour through the castles of the Loire Valley with the Normants, he learned about how the French bourgeoisie thought and behaved. In other words, he laid a finger on the social and cultural mechanisms of French society. 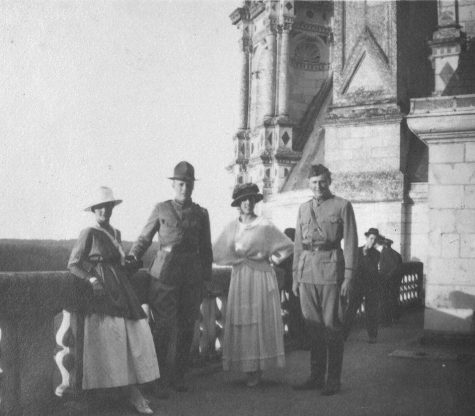 Quentin Roosevelt (far left) with the Normant family at “Le Château de Chambord,” September 23, 1917. [MS Am 2925, box 5, folder 99] Houghton Library, Harvard University. Quentin Roosevelt (second from left) with the Normants in Chambord, September 1917. [MS Am 2925, box 5, folder 29] Houghton Library, Harvard University. This had direct influences on Quentin when it came to military culture. 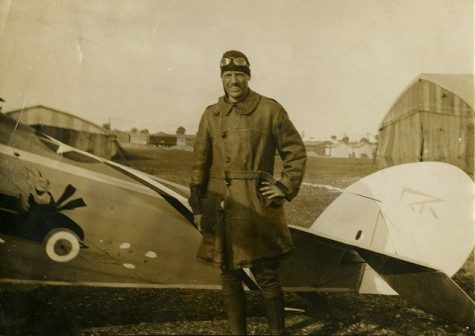 On March 7, 1918, Quentin met French “ace pilots” and learned their tricks and about their fears. With a million and a half American soldiers, plus the military forces of the British Commonwealth, Belgium, and Portugal, France was very much an international land. Twice, Quentin himself had dinner with Portuguese pilots. When Quentin died on July 14, 1917, what had been a cultural relationship between the French and Americans swiftly turned into a symbolic bond. All of a sudden, he became a public subject in the newspapers, causing the highest foreign authorities as well as unknown people to present their deep and numerous condolences to the family. Poems were written on his death and the meaning of his sacrifice. Soldiers made pilgrimages to his grave, and sent dried flowers from the trees surrounding the grave to the family. The common emotion of grief was also turned into an intellectual and symbolic signification. The son of a former president symbolized the fight of democracy against the autocratic German Reich that kept the sons of Kaiser Wilhelm safe and hidden. This is how the story was told and felt in American society. Quentin became more than a subject of American enthusiasm and propaganda for war: he was also a subject of French attention; he helped to build the American-French relationship; and he was consecrated by the French, who named village squares and military boats after him. 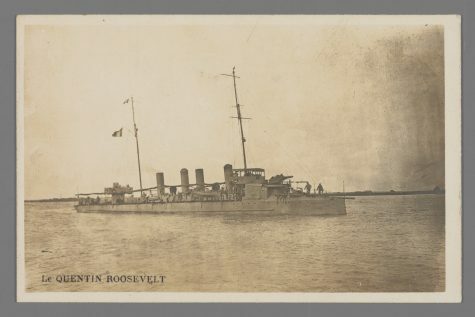 Photograph of French warship Le Quentin Roosevelt. [MS Am 2925, box 4 ] Houghton Library, Harvard University. Many stories can be reported thanks to Quentin’s records held at Houghton Library. Using the resources of the Theodore Roosevelt Collection, it was a great pleasure to share this knowledge not only with the academic community, but also more widely with the people and visitors of Harvard by displaying a public exhibition on Quentin Roosevelt and World War One.